You must be a member of the Johannesburg Russian Tea Room Group to attend this activity. Would you like to join this group? Going to Moscow soon? Interested in Russian history? 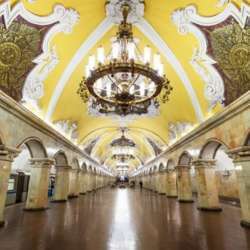 Come listen to an amazing story of Moscow metro. Kristiaan will give us a presentation filled with pictures and I will provide some tips for metro trips. We meeting for a regular Russian tea room event which will be followed by tea or lunch - you can choose from extensive menu, also they have great sushi. A Russian pianist is joining us so we will listen to some Russian music too.